Our Tailors Measure Tape with Short Metal Ends is suitable for professional and educational tailoring. It has a simple, flexible design that has long been associated with this profession and allows you to create garments with the perfect fit. We have designed this measuring tape to be a compact tool that rolls up easily to store in sewing kits. We use a durable and flexible plastic throughout which moulds around your mannequin or model. Metal-tipped ends add another level of durability to this tool, minimising the risk of ripping or tearing. This also gives you a straight line to measure from when cutting pattern shapes, to guarantee a final outfit that fits together perfectly. For added convenience, the printed inch and centimetre markings feature in a bold black which can be read from a distance and clearly. When rolled out entirely, this tailors measure tape can be used to take measurements anywhere up to 60" or 150cm - depending on your need. Whether you're learning to cut fabric pieces for the first time or are a seasoned professional, this is the tool for you. 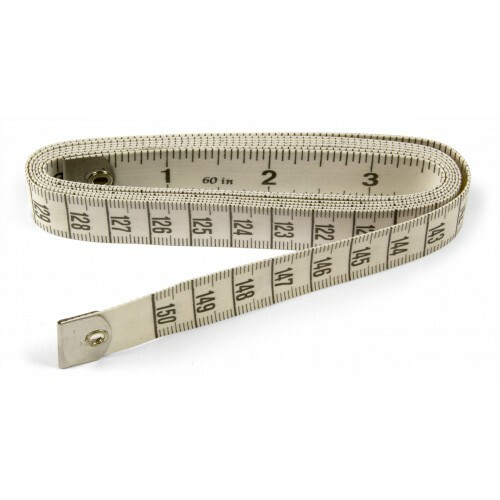 As part of our extensive range, The Ruler Company is proud of our collection which tailors to both professional, amateur and educational environments. We also offer bulk order discounts for those ordering in larger quantities. For orders of 10 rulers or more, we can provide an individual product price of just £0.84. For big orders of 100 rulers or more, we can provide an individual product price of just £0.72.